The ride is staged from Libertytown Park’s parking lot. The 28 mile ride consists of 1,500 elevation gain. The hardest climbs come early in the ride, but there is only one climb, the first, that exceeds 10%. 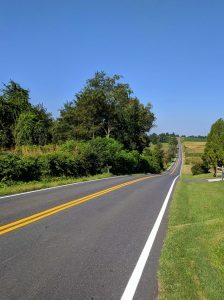 The ride features many attractive vistas and several miles of back roads. There will be a rest stop after 15 miles in Union Bridge. The Milkhouse Brewery is close to the ride’s end for those who might be thirsty. Cue sheets will be provided: GPS data is available on RWGPS. I be riding a C pace but you are welcome to surge ahead.